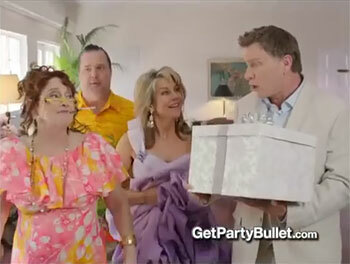 In the Party Bullet infomercial, Mick and Mimi are hurrying to get to a wedding they are already late for. 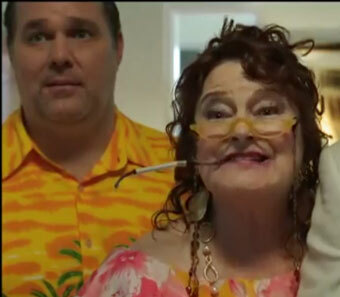 With them are cigarette-chomping Hazel, a fan favorite character not seen since the Magic Bullet to Go infomercial, and a new character named Sherman, who continues the tradition of the fat-life-of-the-party role previously supplied by Berman and Ralph. 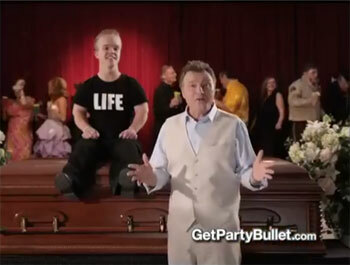 As the result of the kind of wacky mix up seen on 1950s sitcoms, they end up in a room where a funeral is being held. Mick and company do not realize what has happened. Yes, they know no one there and there is a casket at the front of the room, yet they still don’t grasp they have mistakenly barged into someone’s funeral. Maybe they were drunk already. After making some inappropriate comments, Mick whips out his Party Bullet, “the world’s first countertop mixologist.” A mirrored disco ball somehow shows up, and the funeral guests begin eagerly drinking, dancing, and generally behaving like the cast of Jersey Shore. 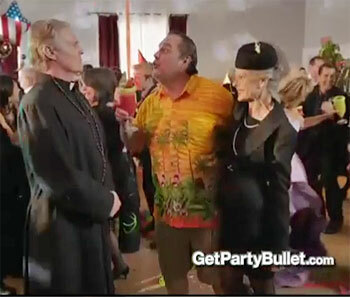 Sherman hits on the grieving widow and tells the priest, “C’mon, father. You can’t spell ‘funeral’ without F-U-N.” Mick makes a midget joke. Such a scene of revelry at a funeral might risk being offensive. At the end, however, Mick knocks on the coffin, and the man inside knocks back. So there really wasn’t a dead man there…just a man about to be buried alive. Another wacky mix up! 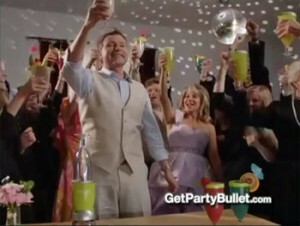 With the Party Bullet, the makers of the Magic Bullet line have given up the pretense that anyone is using their products to make guacamole, alfredo sauce, or muffin batter. They finally admit that anyone who buys their stuff does it so they can get smashed. To this end, they announce recipes for “signature cocktails” named after the characters on the infomercial: the Mickarita, Mimito, Hazeltini, and Sherma Colada. Fans of characters on the previous Magic Bullet infomercials will be forced to come up with their own recipes for the Bermanhattan and the Grandmai Tai. 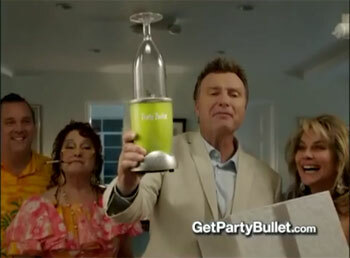 A big thank you on the rocks with salt to Jack Carnighan for letting us know about the Party Bullet infomercial! I think the age of the actress who plays Hazel has finally caught up to her character. Did they recast Hazel? If that’s the same actress, she hasn’t kept it together too well. So Sherman gets the widow but Hazel doesn’t get to hook up with anybody? When Mick knocked on the coffin, it should have opened up and then Hazel would stagger out of it, having had her way with the corpse. I love how Mick says “Party” in a pseudo-American accent. Every single time. “Q: When can I see the infomercial again? 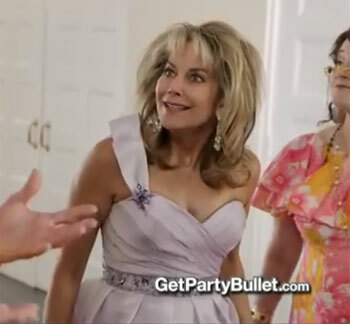 Does this mean there is a longer Party Bullet infomercial somewhere? So Berman must have taken the copyright for his character with him when he left the Magic Bullet franchise, thus prompting them to create a knockoff named Sherman. This must mean Berman is a free agent now. Watch out, Mark Rosen! Wow! Mimi is lookin’ hot! I would say that all these years of hard partying are starting to take a toll on Mick and Mimi as well. They all look different. 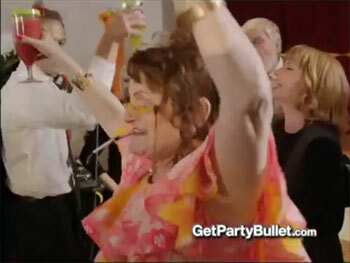 Which, of course, only proves that the Party Bullet is as awesome a party machine as they claim. Now I’m going to spend many a sleepless night flipping around the dial looking for this thing. Sure I can watch it on the internet now, but somehow it’s much more magical at 3 in the morning on a fuzzy old TV screen. So if we take this infomercial at face value, the demographic Magic Bullet now sees itself as really aiming for is that enormous, untapped market of widows, midgets and Catholic priests? I’ll just state the obvious here – these infomericals aren’t as funny because they’re actually TRYING to be funny. The whole reason the two original ones were hilarious is because they were sorta trying to be funny but failed miserably. They fail here as well but now they’re just trying to hard. Plus, no Berman = no fun. And that should be *too* hard. Omg, I’ve seen that midget guy before! He surely gets around haha.